The quickest way to run a Java program is by using the Package Explorer view. Select Run As → Java Application. The same action can be performed using the Package Explorer view by selecting the class that contains the main method and clicking Alt + Shift + X, J. Either actions mentioned above create a new Run Configuration and use it to start the Java application. If a Run configuration has already been created you can use it to start the Java application by selecting Run Configurations from the Run menu, clicking on the name of the run configuration and then clicking on the Run button. 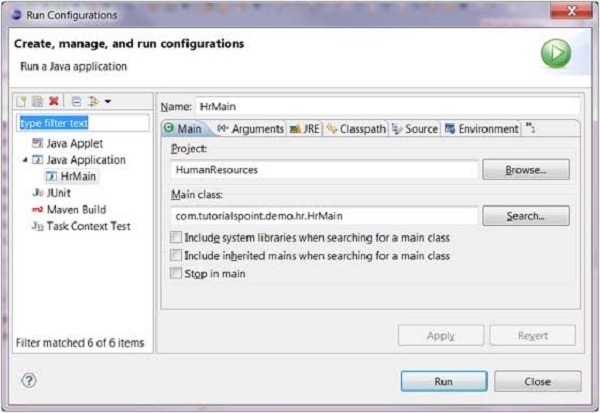 The Run item on the Run menu can be used to restart the java application that was previously started. The shortcut key to launch the previously launched Java application is Ctrl + F11.